"Uponor has a strong sustainability culture and looks to provide products that align with the company’s philosophy of respecting the vital balance between people, planet and profit," says Jayson Drake, director of Portfolio Management at Uponor. “Extending our current offering of Uponor AquaPEX Reclaimed Water pipe supports our mission of providing products that help our business partners build sustainable structures around the world." Uponor's extended offering, which is available in 300-ft. coils for ½", ¾" and 1" sizes and 10-ft. and 20-ft. straight lengths for 1", 1¼", 1½" and 2" sizes, provides all the benefits of Uponor AquaPEX that plumbing engineers and contractors have come to rely on — flexibility, durability, corrosion resistance, a 20-year proven history in plumbing, a 25-year limited warranty, and one simple ASTM F1960 ProPEX® expansion connection system that does not require any torches, glues, solvents or gauges. "The best part about Uponor AquaPEX Reclaimed Water pipe is the fact that plumbing professionals don’t have to switch products when installing potable plumbing and reclaimed water systems,” says Drake. “They can seamlessly move from Uponor AquaPEX for the potable system to Uponor AquaPEX Reclaimed Water for the reclaimed water system without having to switch piping materials, tools or fittings." 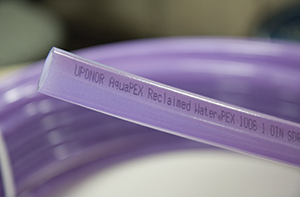 Uponor AquaPEX® Reclaimed Water pipe is the first PEX pipe available in sizes up to 2" for reclaimed water applications.